Monumental brasses are commemorative plaques that served as effigies and were most commonly found in churches. The earliest examples come from the thirteenth century but they were popular up until the seventeenth century and then again in the Victorian Gothic Revival. Surviving brasses from the medieval period are limited due to the turbulent history of the Church but they do survive in considerable numbers in the East of England, Germany and Flanders. Made from an alloy of copper and zinc, a material known as latten, they were laid into church floors and walls. Monumental brasses are historically and stylistically significant because they record dress, architecture, armoury, heraldry (coats of arms and insignia) and palaeography (handwriting) in a dated object. In addition they tell the story of memorial and patronage. The practice of recording brasses through a process of rubbing originates from the Victorian Gothic Revival. An early method of pouring printer’s ink into engraved lines and then placing damp tissue paper over the brass was replaced around the mid-nineteenth century with the more effective technique of using black shoemaker’s wax, known as heel ball. 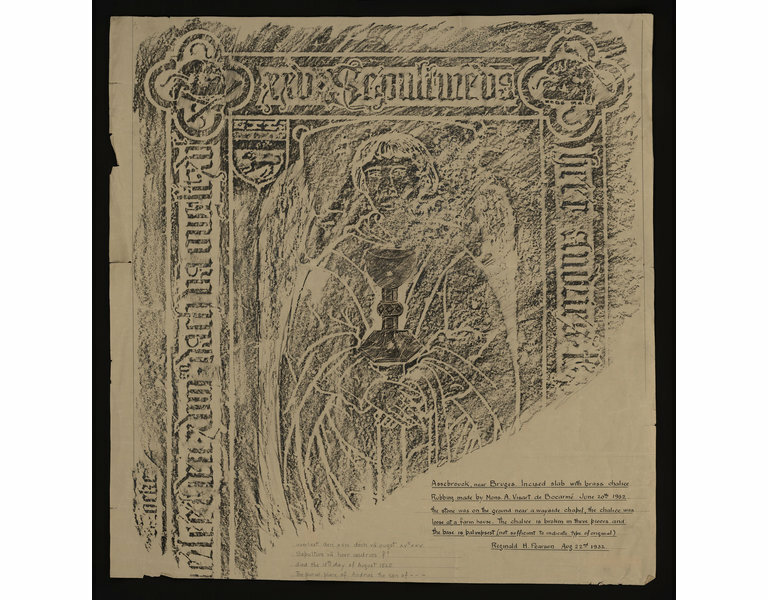 Brass rubbing continued to be a popular hobby into the twentieth century before the process was understood to cause damage to the brasses. 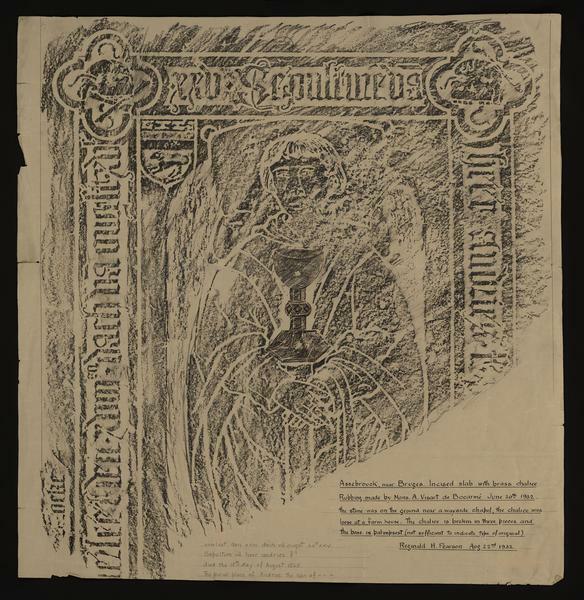 Rubbing of part of a monumental slab commemorating Andries [surname illegible] (d.1525). The slab depicts a mutilated effigy, marginal inscription, and shield. 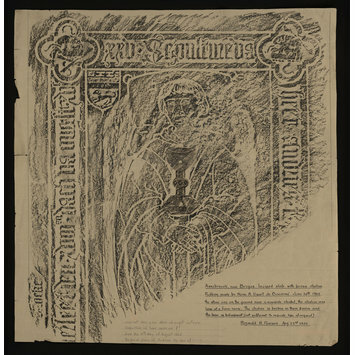 The image is superimposed with a rubbing of a brass chalice.